This chart from Reuters is making the rounds on Twitter today. Quickly, tell me whether the Gun Law in Florida did well or poorly. That of course is the entire purpose of the chart. If you are like me, that is, you have knowledge in your head of time-series line charts, you probably experienced that moment where the bottom fell out and you didn't know which way was up. This is the double edge of novelty in charts. There should be a very high bar against running counter to convention. Readers do bring their "baggage" to the chart, and the designer should take that into consideration. Some commentators are complaining about trickery. That may be true. But it's also possible the designer actually thought reversing the direction of the vertical axis made the chart better. Don't forget about we have another convention: up is good and down is bad. Fewer murders is good and more murders is bad. So why not make it such that a rising line indicates goodness (fewer murders)? Going back to the Trifecta Checkup. This chart has dual problems. We just talked about the syncing between the data and the graphical element. The other issue is that the data is insufficient to draw conclusions about the underlying question: what explains the shift in number of murders since the late 2000s? This is a complex problem--the chapter in Freakonomics about abortion and crime rate is still instructive, not for the disputed conclusion but for the process of testing various hypotheses. The reduction of the complex causal structure to a single factor is dissatisfying. moving the x-axis labels to the top might help to avid misleading the reader. The baseline appears to be at the bottom unless you check the y-axis. as i am reminded daily, if you expect people to "think" then you will be let down. :) reduce the amount of mental exertion required and your message is more likely to be received as intended. If you're going to invert a chart like this you better have a damn good reason. Trying to make it look like dripping blood is 1) not a good reason and 2) completely failed, visually, in this attempt anyway. This is like saying "No, on this street, red lights mean 'Go'". Pointless, and makes absolutely certain the majority will misinterpret. The convention that up is more, down is fewer, is far stronger and more basic than the idea that up is good and down is bad - the latter is an attempt to overcome a false problem, IMO, and is very misapplied here. Another issue is that the statistic chosen - frequencies (not meaningful) instead of rates (meaningful). Over a period of more than 20 years, this seems likely to make quite a difference given the population growth in the southern U.S. (though I haven't checked Florida statistics specifically). And you're right about the complex causal structure, of course. Basically, this is a problem where a bivariate analysis (as in the chart) is particularly misleading. 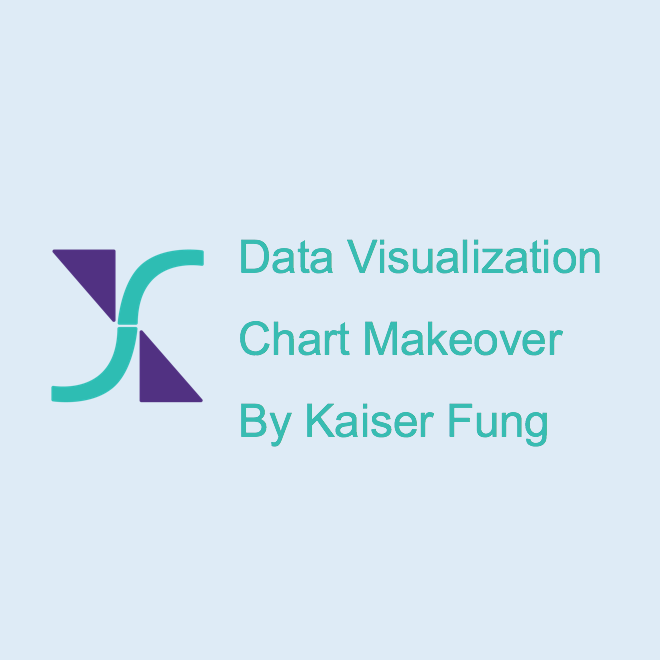 The designer, Christine Chan, has tweeted her reasons, and I'm grateful to her for doing so, since it illuminates for me the nature of the errors she made when she set out to reproduce the effect of the chart she was inspired by. The original chart was a column chart. These are quite forgiving of changes away from conventional direction, because they have a fairly clear distinction between what is the column, and what is the background field. Area graphs give a much less clear set of clues. You might think it's obvious white is the background, but as this case shows, it's really easy to think white was the quantity, set against a red background. Further, she marked the edge of the area with a heavily-decorated line chart, something I see often where a designer doesn't really have the courage of her convictions in an area chart. The danger is that the line will dominate, and lines *really* don't have a strong set of clues which way round the data is. With interval data that might not matter; with ratio data (to use the language of S. S. Stevens) she was asking for trouble. Ratio data is, of course, especially well suited to column charts. Finally, she did what the original Iraq chart didn't, and put the time scale on the bottom, where it looked misleadingly like a base line. Gun deaths are probably a fairly good guide to how badly the economy is going. Just to pile on... the chart also conflates gun deaths (title) with murders committed using firearms, when the latter is only a subset of the former. The white area reminds me of the Indian Ocean (with India the "dip" in the 2000's and Arabian peninsula on the left.) I'm not suggesting some geographic-based conspiracy, though. - I can't find the original Reuters article anywhere online. - I can't find a C. Chen on staff at Reuters. The closest I can find is an Eddie Chan, but he covers technology. - If it is the same Chan, the chart indicates it was created in mid-Feb, but Eddie Chan doesn't say anything about it around then. wdr1: see the comment by derek above. Not only is this real but the designer explained how this chart came about. Really great conversation around this chart. Yeah, if Edward Tufte were dead, he'd be spinning in his grave.